I hate to admit that I am a Master Gardener. People expect me to do everything the right way. You know, to actually follow all those helpful hints you read in books, magazines and garden blogs. Well, don’t tell anyone, but the reality is that I am human. And, I don’t always follow advice - even my own. And yeah, I make mistakes. These next few blogs are the confession of a so-called Master Gardener. Honestly, way too many to contain in a single blog. I still buy plants on impulse! Just because I like the color of the flowers, without the faintest idea where it will go in my garden, or how to make it grow. And shhhh – I’ve often killed many of those plants. Then there are the plants I can’t seem to get rid of. For example, once I carelessly sprinkled Morning Glory seeds (Ipomoea tricolor) in my backyard. No big deal right? After all they are annuals. They’ll die back in the fall. I had gotten seeds from a friend, who stored them inside an old mason jar. 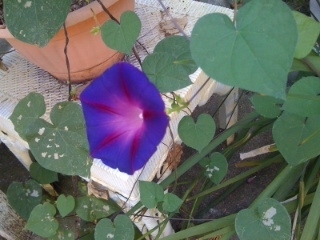 I have always loved Morning Glory because they remind me of my Grandmother in Japan. Her name was Hatsue, but everyone called her Obachan (Grandma). One day, I just carelessly sprinkled all the seeds along the fence. I planned to hang string for the vines to climb upon, once they sprouted. Boy, did I underestimate the tenacity of those itty bitty round seeds. Year after year, they spout, grow and then manage take over the entire backyard. They will crawl along the ground, climb on the fence, and wrap around bushes and the tree. If I don’t start pulling the sprouts early in spring, my yard will be completely covered by summer. Then as to grandstand the fact they have won, they start to bloom. They seem to mock my every effort to contain them. I do manage to hack them into some kind of submission each year, and then clearing them out in the winter. So here’s a warning to Morning Glory lovers, they can become a highly evasive plant mostly because they reseed themselves. But in the right location, they are very beautiful and provide flowers every morning from early spring until late fall. Every fall, I pull and remove the old vines and sweep up the pods, but I haven’t managed to remove the Morning Glories completely. But to be honest, I don’t have the heart to completely get rid of the Morning Glory because there is a part of me that loves it when they bloom. Each spring when I see the first tenacious deep purple flowers, it reminds me of Obachan. She was a gentle and quietly stubborn woman, who always managed to get her way - much like these vines. Perhaps Obachan’s sprit has something to do with these flowers coming back year after year. She’s using them to remind me of my Japanese roots and to make sure that I wouldn’t forget her. It appears that the lesson learned from my gardening mistakes don’t necessarily yield only practical knowledge, sometimes they provides lesson for the heart, too.